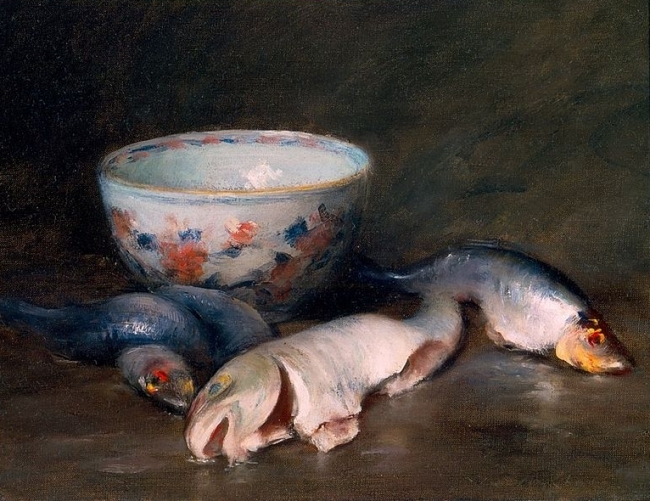 “Still Life With Fish,” oil on canvas, by William Merritt Chase, 1910. The park is close to the chaos of Michigan’s largest shopping outlets, and I guess I chose this park for its proximity to this chaos. Many kinds of corporations around the world manipulate their numbers. You’d be surprised by how corrupt our global business infrastructure really is. My job was to investigate any possible corruption and report my findings to an independent third party. I relished performing my job, in 33 countries, for seven and a half years. But I have lost that, too. The sky is the dim hue of shale, the air about to crust. It’s cold but there’s nothing else to do. Across the pebbled street from the baseball field no one uses, the perfectly circular pond is ringed by reeds that look like wheat but are something else. They sway in the breeze in the same fluid way as a flock of synchronized starlings. But there are no starlings anymore. There’s no breeze, either, and the pond is flat. My wooden bench is splintered in 24 different areas. The CATCH AND RELEASE sign stands like a sentry, but I’ve been coming here every day for the past four months and never seen anyone fishing. I thought once maybe I could. I thought once I could maybe do something like fish. Until the pain arrived. Even if I could help, helping requires speaking, facial animation, and I can’t do that anymore. What I have to do is close my eyes despite knowing it probably won’t instill any sort of peace. Peace, I am learning, is a physiological deception, an ink blot that just creates a falsified result. When the pain is this bad, I want to position a shotgun against my right cheek and liquidate my face. But I always feel pathetic because I know I don’t have the balls. All the doctors, all the medications. You seek help for yourself, you search for answers, and maybe you don’t improve right away, fine. But you try and you try and you try to help yourself only for your condition to progressively deteriorate? As if to spite you? Tell me how that should make sense. Sometimes I can retreat so deep into the dark behind my eyes a light sliver of the pain disintegrates. But lately I have not been able to retreat, and the pain festers, concentrates, overwhelms. I miss so much what I have lost. There’s rattling and fidgeting and sighing and then a thump as if his hands collapsed on his thighs. “The instruction manual said, ‘Easy to Follow.’ Easy to follow! Can you imagine? And here I am!” He starts laughing. I see people who smile and laugh so joyfully and carefree, who obviously take these acts for granted, and I develop a strong yearning to smash their face and hope I have caused enough damage to induce my exact condition. Then they would understand. Maybe then there would be no loneliness. “At least I’m not the only one. I saw a gentleman,” the guy says, “who kept sticking a dollar into a vending machine only for the vending machine to keep spitting it out. He could not comprehend that he was putting the dollar in upside down.” The guy laughs louder, like this is the funniest thing he has heard in his life. And I open my eyes, against the pain. My hands have built huge fists and I can’t feel them and that’s not good. “I mean, the effort is certainly there. He’s trying, you know? But, for whatever reason, he does not notice the display above the slot that shows how the dollar must be inserted.” The guy studies the fishing rod in his left hand, the worm in his right. “My problem is the opposite. I comprehend the directions, but I cannot execute them.” He laughs like this is even funnier. 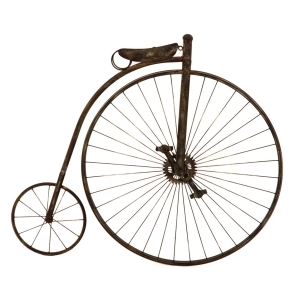 James Hartman’s fiction has been nominated for the Pushcart Prize and Best Small Fictions, and appears or is forthcoming in Blue Fifth Review, december, New Flash Fiction Review, The Offbeat, and New World Writing, among others. His scholarly work is featured in The Hemingway Review. He has several degrees, including a Master of Fine Arts in Creative Writing, and lives in Michigan with his wife.